PHUKET: The captain of the tour speedboat that slammed into an oil tanker off Phuket’s east coast while returning from Phi Phi Island on Saturday (Feb 9) faces a criminal charge of recklessness causing injury – and will have his boat operator’s licence suspended and the speedboat itself temporarily de-registered. 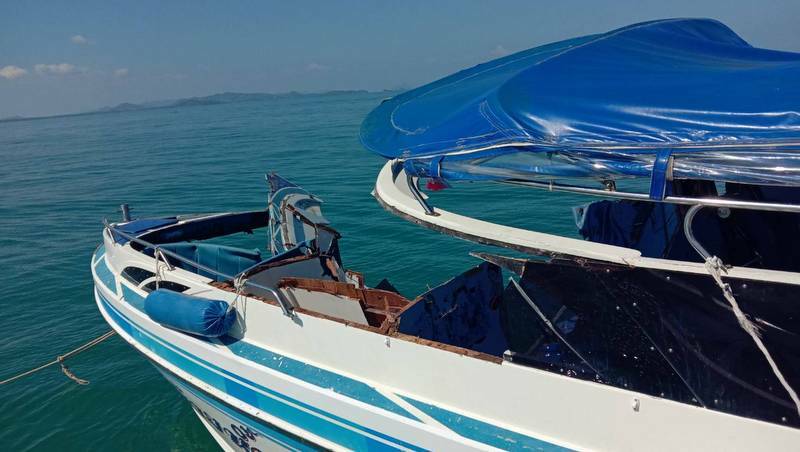 The serious moves to enforce marine safety regulations follows the twin-engine tour speedboat Sainam slamming into a small oil tanker off Koh Rang, off Phuket’s east coast, on Saturday. 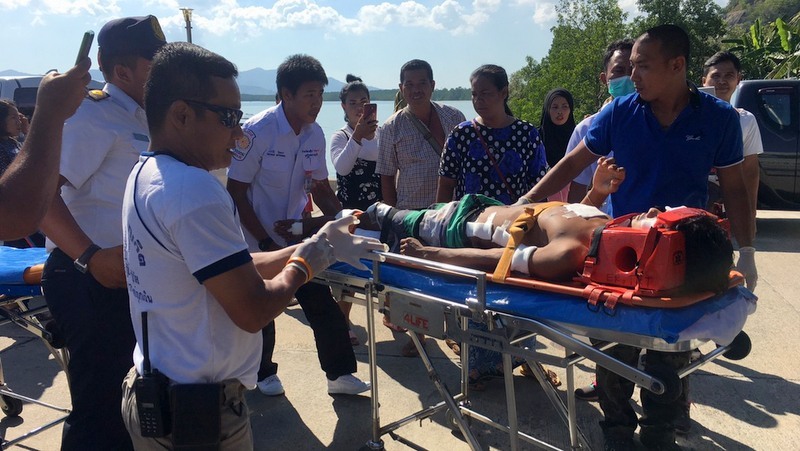 Eleven Chinese tourists on board were brought ashore and given first aid, before being taken to Mission Hospital and Thalang Hospital. Phuket City Police Chief Col Sompong Thiparpakul confirmed to The Phuket News today that nine of the tourist have already flown home to China. The remaining two have also already been discharged from hospital care and are to fly home today (Feb 13). 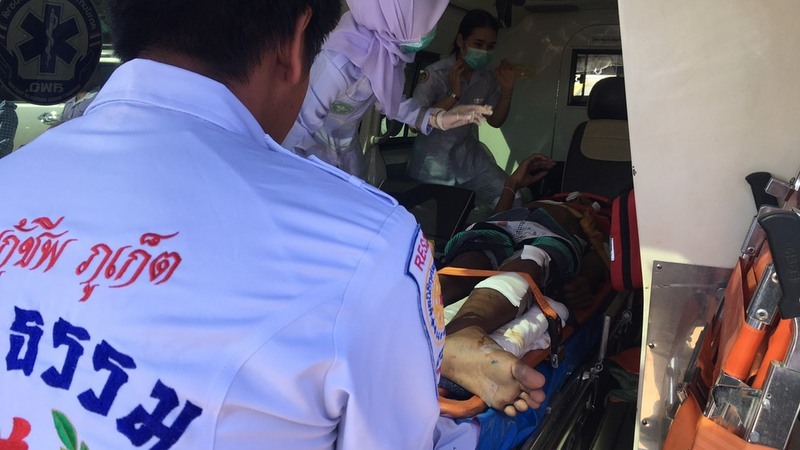 The speedboat captain, who Col Sompong identified as 21-year-old Apichart Rakkarndee, remains in hospital care with a broken right leg. Col Sompong explained that Apichart in his initial statement to police said that the collision occurred due to “mechanical failure with the engines”, which would affect how the speedboat was steered. “We have not yet questioned him more throroughly as to how the accident happened. We are waiting for him to recover a little more first,” Col Sompong said. “However, he did say that he could not control the boat, that it was an accident,” he added. “The investigating officers from Phuket City Police have charged Mr Apichart with recklessness causing injury to others, but Mr Apichart has denied the charge against him,” Col Sompong confirmed. Regardless, Phuket Marine Office Acting Chief Wiwat Chitchertwong today confirmed that his office has already deemed Apichart’s actions as careless. “Our officers have completed their inspection of the speedboat Sainam and have found that the speedboat captain, Mr Apichart, was reckless in his behavior. “Therefore, after Mr Apichat’s health has improved, we will suspend his boat operator’s license. We have yet to decide how long the suspension will be, but the maximum is two years,” Mr Wiwat said. The boat Sainam itself has also been temporarily de-registered, making it illegal to use until his office restores its status, Mr Wiwat noted. "The serious move to enforce marine safety regulations". Why were they not enforced? Chinese can't be happy as they continue to be victimized in Phuket tragedies. All "captains" should be tested immediately and regularly for knowledge, skills and intoxication to be certified and licensed before they are put in control of tourist lives. This fool should be put in jail for playing chicken with an oil tanker. 21 year old 'captain'- clearly qualified for the job.